FULTON – Thanks to the generosity of Central New York Community Foundation, and Cortini’s Shoe Repair in Fulton, CNY Arts Center has new fire safety curtains. The cast of Legally Blonde, Jr sends a message of thanks to Central New York Community Foundation and Cortini’s Shoe Repair for the fire safety curtains behind the cast. 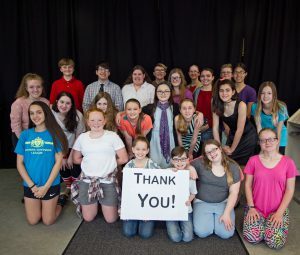 With a grant from CNY Community Foundation, the Arts Center was able to purchase flame retardant, light-blocking and sound-reducing Commando Cloth. The 16-ounce heavy felt like fabric was researched and found to be the best option for meeting fire code requirements and blocking daylight at the theatre, which was then sewn into curtains at Cortini’s Shoe Repair. “We couldn’t be more grateful to have their help and the support of the CNY Community Foundation in meeting this critical requirement. Now we know we are providing a safe environment for our participants and audience members when they attend an event. Especially important when we host large productions like Legally Blonde Jr opening May 4 with anticipated sell-out crowds,” she added. The Arts Center is located at 11 River Glen Drive on the Cayuga Community College Campus. For more information, visit CNYArtsCenter.com or call 315-598-ARTS (2787).